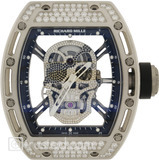 Richard Mille RM 011 Automatic Flyback Choronograh Watch 511.04AA.91O-1: This rose, pink gold titanium case watch with black trim features a skeletonized automatic winding movement with adjustable rotor geometry showing hours, minutes, seconds, chronograph, 60 minute countdown timer, 12 hour totalizer, oversize date and month. Available in titanium, red and white gold with central caseband in titanium or red gold. Also available in titalyt or carbon. Herald at their intial release in 2001 as a break from the past and a new direction of horology, the wristwatches of Richard Mille were from their very inception, extraordinary and uncompromising. CALIBER RM011-S: skeletonized automatic winding movement with adjustable rotor geometry offering hours, minutes, seconds, chronograph, 60-minute countdown timer, 12-hour totalizer, oversize date, month. Dimensions: length 50 mm x 40 mm (widest point) x 16.15 mm (thickest area). • Circa 50 hours without chronograph running. • Actual power reserve results will depend on the period of time the chronograph is utilized. The manufacture of these components in grade 2 titanium with black PVD coating allows the whole assembly to be given great rigidity, as well as precise surface flatness which is essential for the perfect functioning of the gear train. By using the pusher between 4 and 5 o’clock, the running chronograph can be reset without first having to stop the mechanism. This was originally developed for pilots, in order not to lose time (and therefore accuracy) from stopping, resetting and starting the chronograph whilst traversing a navigational point. Running operation: The user can start or stop the chronograph function via the pusher located between 1 and 2 o’clock. The Flyback Function can be continuously reset at will by depressing the second pusher located between 4 and 5 o’clock. Stopping: Use the start/stop pusher between 1 and 2 o’clock to stop the chronograph, then depress the reset/flyback pusher once. Automatic adjustment for months of 30 or 31 days. Semi-instantaneous, placed in a red outlined horizontal aperture under 12 o’clock. Semi-instantaneous indicate with Arabic numerals, placed between 4 and 5 o’clock. This exclusive RICHARD MILLE design allows the rewinding of the mainspring to be adapted most effectively to the user’s activity level whether it be sporting or non-sporting environments. By adjusting the setting of the rib’s placement, the rotor’s inertia is modified to either speed up the winding process in the case of leisurely arm movements, or slow it down when sporting activities are pursued. As a result, this invention allows the movement’s winding mechanism to be optimized and personalized to the owner’s lifestyle. The double barrel system helps to improve the torque stability over a longer period. This is achieved by using more rotationnal turns, thereby reducing pressure and friction on the teeth, the bearings and the pivots, resulting in improved long-term performance. This permits better control of the torque applied to the screws during assembly. These screws are therefore unaffected by physical manipulation during assembly or disassembly and age well. This was the subject of an entire year of research and development. With regard to the production of each case, 68 different stamping operations are required for the three main components (bezel, middle section and case back). The machine tooling process requires 8 days of adjusting the machines for the bezel, 5 days for the middle section and 5 days for the case back. Prior to this process, developing a methodology for carrying out this series of operations took 120 hours, the drawings for the tools 130 hours, and implemention 180 hours. Each rough case involves 202 separate machining operations. The design and execution of the watch demonstrates a complete conceptual approach to the movement, case and dial. As a result, everything has been constructed according to an extremely rigorous specification, in the manner of the analytical engineering methods used in the design of Formula 1 racing cars where the chassis and the engine are developed in complete harmony. For example, a casing ring is no longer used and the movement is mounted on chassis mounting rubbers (ISO SW) fixed by 4 titanium screws. Features such as these are evidence of uncompromising workmanship. The tripartite case is water resistant to 50 meters, ensured by three Nitril O-ring seals. 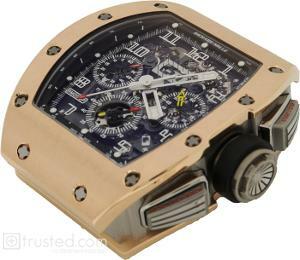 The case is assembled with 16 spline screws in grade 5 titanium and abrasion resistant washers in copper-nickel-zinc alloy. In carbon fiber; index points filled with approved luminous material. In grade 5 titanium, with double seal O-ring and collar in Alcryn. In sapphire (thickness: 0.40 mm) with anti-glare treatment (2 sides), protected by 8 silicon braces inserted in the upper and lower grooves. • Bezel side: in sapphire (1800 Vickers) with anti-glare treatment (2 sides). • Screw slot and screws beveled and polished with rounded and polished tip.